This is a powerful question, and if you're a fan of the Serial podcast or a House of Cards addict, you know the strong feelings attached to this question -- the anticipation, the flurry of thoughts, the rundown of different scenarios. You hunger to know the answers and the ending. Now, how many advertisements leave you asking this question? Most ads wrap up the story in a nice bow in 30 or 60 seconds. The story comes full circle -- problem and solution -- and ends with a smiling consumer. 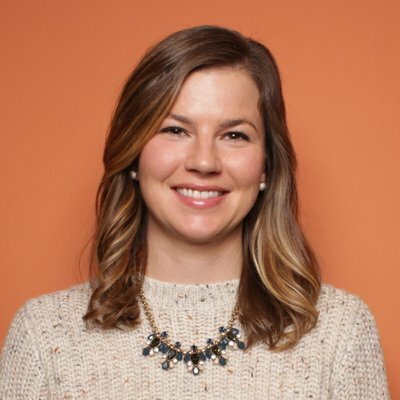 Brands and agencies are obsessing over the idea of storytelling in marketing and advertising. But they need a few lessons in the craft from one of the most innovative ad man in the industry -- Howard Luck Gossage. Gossage, who coincidentally hated advertising, ran an agency in the 1950s and 60s in a converted firehouse in San Francisco. 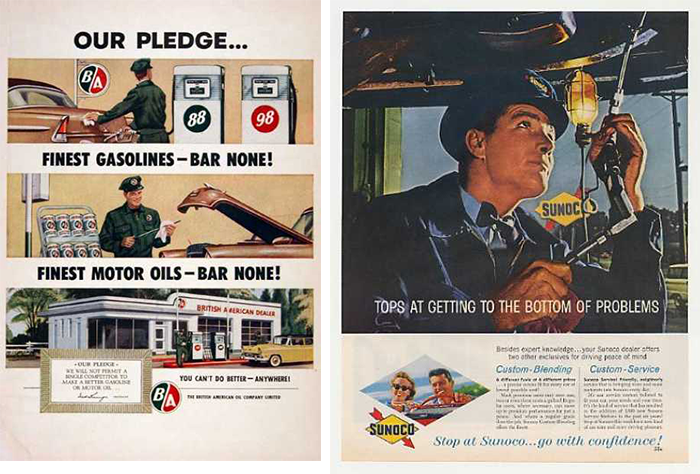 While rarely spoken about in the company of other legends of the same era, such as Bill Bernbach and David Ogivly, Gossage created some of the most interesting advertising of the time. Specifically, his serialized print advertisements should be read, reread, and studied. If you want to learn how storytelling can be applied to advertising, study the work of the man known as the "Socrates of San Francisco." Nobody likes to go to gas stations; having your car service is about as much fun as getting your pants pressed while you wait. You can save yourself an awful lot of time and trouble, and you can save us money, if you won't waste it in ordering people to always drive in to one of our stations. If you're driving down the road an you see a Fina station and it's on your side so you don't have to make a U-turn through traffic and there aren't six cars waiting and you need gas or something, please stop in. Meanwhile, we'd like to be able to give you a better idea of what the air in your tire will look like on P.A. Day, May 12th, 1966. 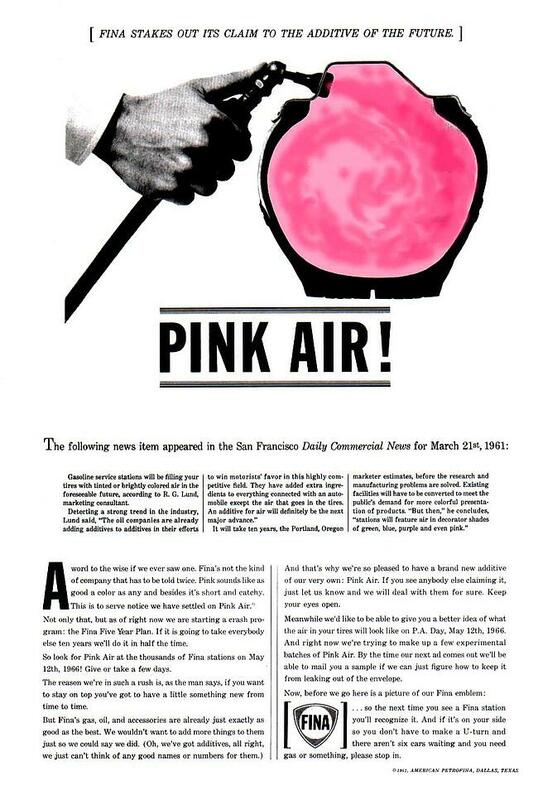 And right now we're trying to make up a few experimental batches of Pink Air. By the time our next ad comes out we'll be able to mail you a sample if we can just figure out how to keep it from leaking out of the envelope. 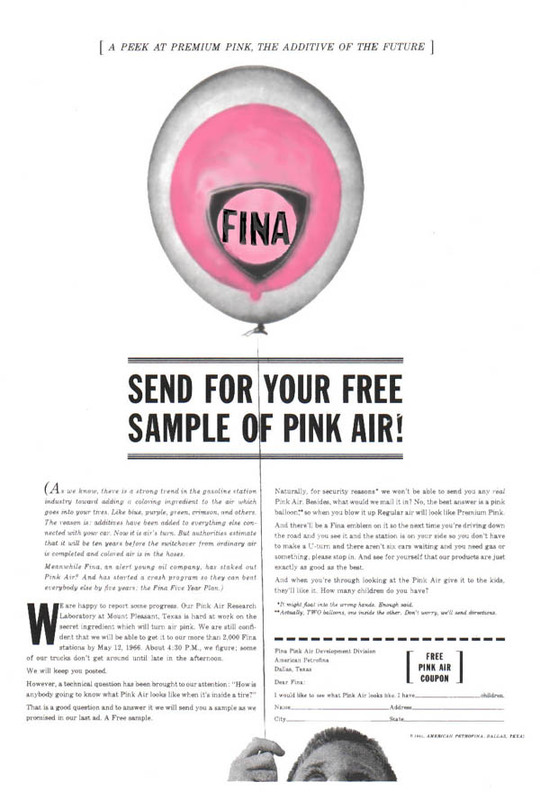 Gossage also created an "interactive" element by asking people to send in for a free sample of Pink Air. 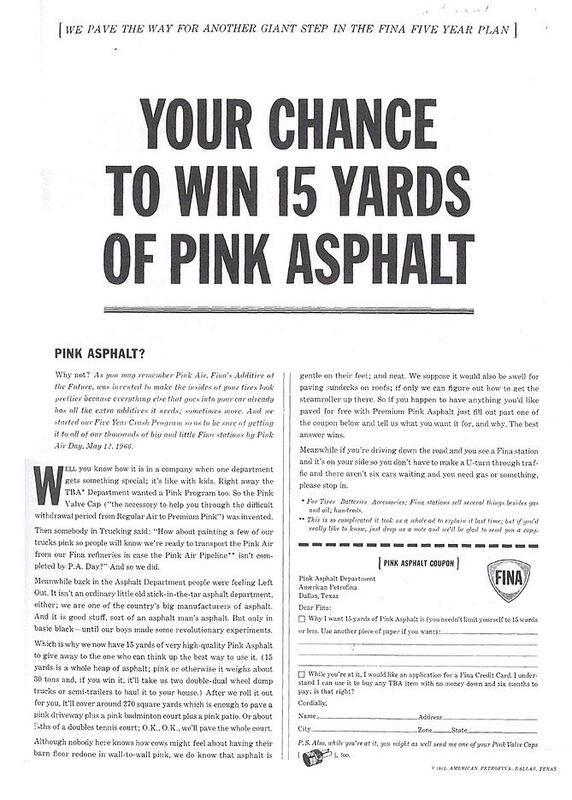 Another ad promoted a contest where people could win pink asphalt. Then somebody in Trucking said: "How about painting a few of our trucks pink so people will know we're ready to transport the Pink Air from our Fina refineries in case the Pink Air Pipeline** isn't completed by P.A. Day?" And so we did. Meanwhile back in the Asphalt Department people were feeling Left Out. It isn't an ordinary little old stick-in-the-tar asphalt department either; we are one of the country's big manufacturers of asphalt. And it is good stuff, sort of an asphalt man's asphalt. But only in basic black -- until our boys made some revolutionary experiments. Which is why we now have 15 yards of very high-quality Pink Asphalt to give away to the one who can think up the best way to use it. 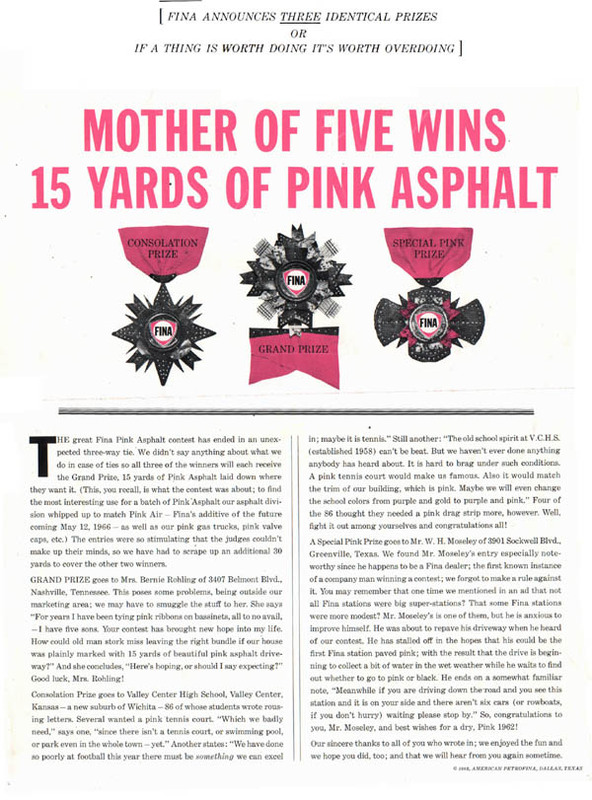 (15 yards is a whole heap of asphalt; pink or otherwise it weighs about 30 tons and, if you win it, it'll take us two double-dual wheel dump trucks or semi-trailers to haul it to your house.) After we roll it out for you, it'll cover around 270 square yards which is enough to pave a pink driveway plus a pink badminton court plus a pink patio. Or about 7/8ths of a doubles tennis court; O.K., O.K., we'll pave the whole court. These ads appeared in The New Yorker exclusively. When an ad failed to appear one week, people wrote to ask: Where is your ad? The creation of a craving on the part of the audience to see the next ad is what brand storytelling is all about. And Gossage was a master at both this and creating a dialogue between the brand and its audience. 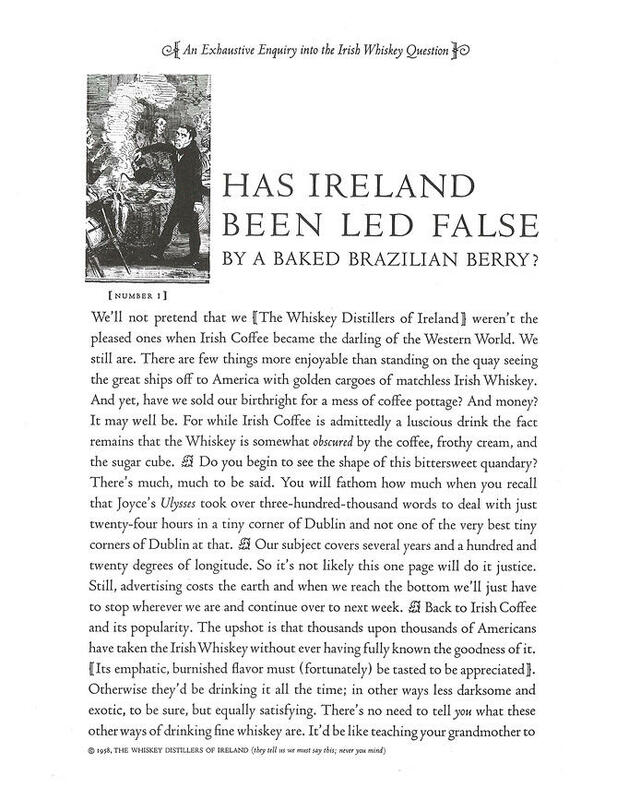 We'll not pretend that we [The Whiskey Distillers of Ireland] weren't the pleased ones when Irish Coffee became the darling of the Western World. We still are. There are few things more enjoyable than standing on the quay seeing the great ships off to American with golden cargoes of matchless Irish Whiskey. And yet, have we sold our birthright for a mess of coffee pottage? And money? It may well be. For while Irish Coffee is admittedly a luscious drink the fact remains that the Whiskey is somewhat obscured by the coffee, frothy cream, and sugar cube. Do you begin to see the shape of this bittersweet quandary? There's much, much to be said. You will fathom how much when you recall the Joyce's Ulysses took over three-hundred-thousand words to deal with just twenty-four hours in a tiny corner of Dublin and not one of the very best tiny corners of Dublin at that. Our subject covers several years and a hundred and twenty degree of longitude. So it's not likely this one page will do it justice. Still, advertising costs the earth and when we reach the bottom, we'll just have to stop wherever we are and continue over to next week. Still, there's not denying that, thanks to Irish Coffee, any number of the Americans have taken Irish Whiskey without having truly tasted of it and that's a fact. What happens is the fragrant coffee and the sugar cube and the cool, frothy cream on top all but drown out the principal ingredient! At no monetary loss to us, mind. It has been a real treat to watch the dear sales curve soaring. But Profit is not all in all; Pride has its innings. We are an enormously Prideful lot when it comes to the elegant, burnished, emphatic flavor of our whiskies. This is why we should like you to buy them, to drink them, to cherish them for themselves alone. "Ah! 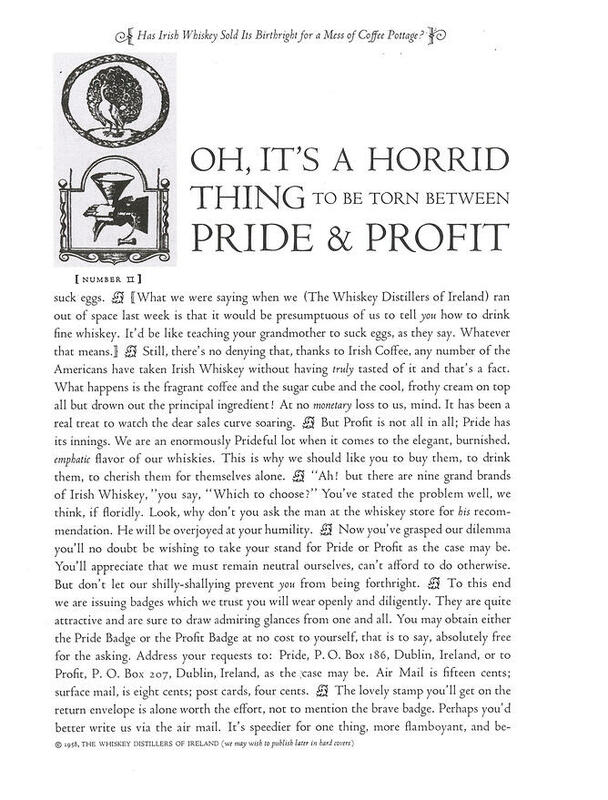 but there are nine grand brands of Irish Whiskey," you say, "Which to choose?" You've stated the problem well, we think, if floridly. Look, why don't you ask the man at the whiskey store for his recommendation. He will be overjoyed at your humility. Now you've grasped our dilemma you'll no doubt be wishing to take your stand for Pride or Profit as the case may be. You'll appreciate the we must remain neutral ourselves, can't afford to do otherwise. But don't let our shilly-shallying prevent you from being forthright. To this end we are issuing badges which we trust you will wear openly and diligently. They are quite attractive and are sure to draw admiring glances from one and all. 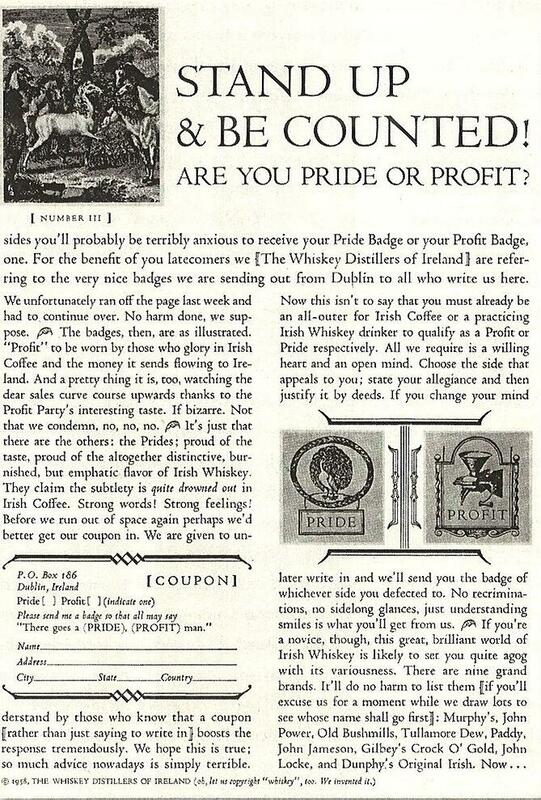 You may obtain either the Pride Badge or the Profit Badge at no cost to yourself, that is to say, absolutely free for the asking. 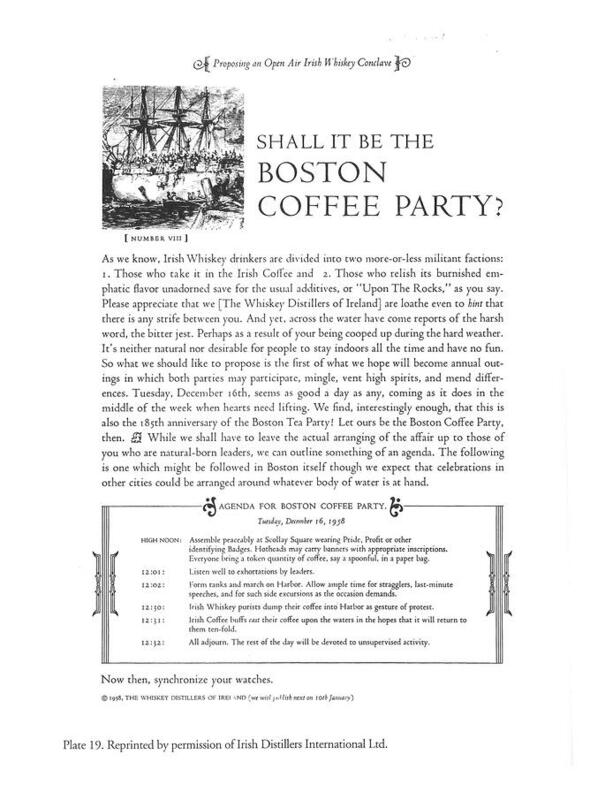 Readers even took it upon themselves to organize events suggested in Gossage's "Shall It Be the Boston Coffee Party?" ad that includes an agenda. The event was held for three years. 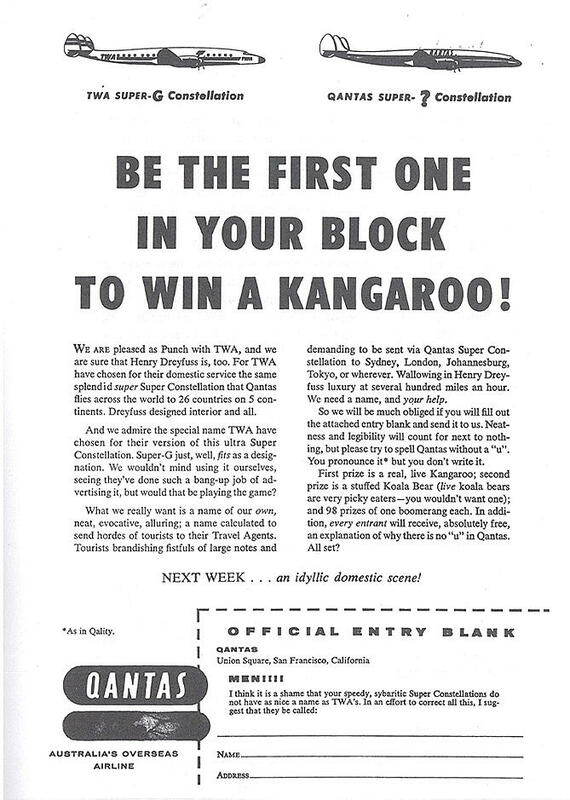 Qantas Airways "Win a Kangaroo"
For $15,000, Gossage created a campaign to highlight Qantas Airways and its flights from the U.S. to Australia. 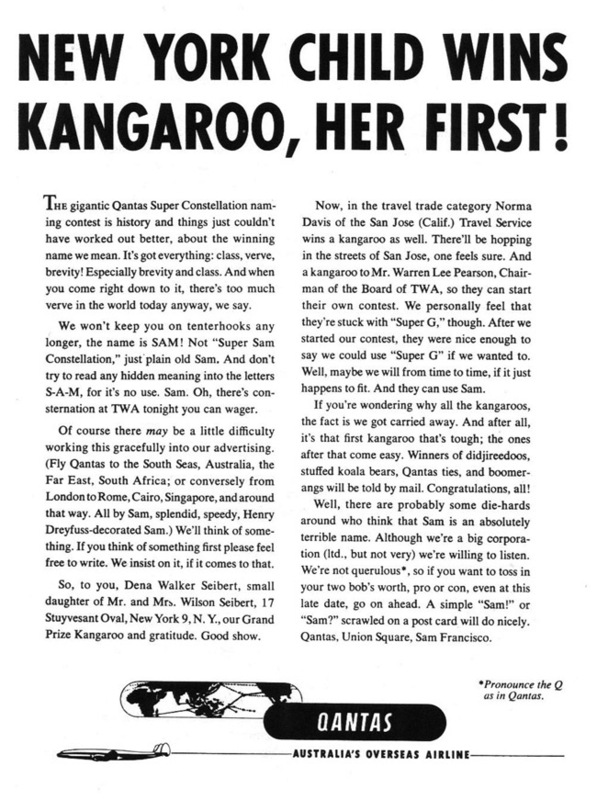 Gossage wrote in his essay Is There Any Hope for Advertising? that "an ad ideally ought to be like one end of an interesting conversation." So we will be much obliged if you will fill out the attached entry blank and sen it to us. Neatness and legibility will count for next to nothing, but please try to spell Qantas without a "u". You pronounce it but you don't write it. These ads are more than interactive or what advertisers like to call "engaging." They have you on the edge of your seat. They have you wondering what happens next -- and that's a powerful reaction.